Know the ins and outs of all your medications. Starting a new medication can be both exciting and scary. A new medication brings the hope of remission. It can also bring the fear of another failed drug and sometimes even fatal side effects. I have been on an unbelievable number of medications and have learned that being intentional and intelligent about how you interact with your doctor in-office when talking about a new medication is crucial to understanding your new medications! Just Ask!- I sometimes do not ask the questions I am thinking about a new medication, because I don’t want to seem dumb. First off, you are not going to seem dumb, trust me when I say, your doctor probably sees a lot of dumb patients and are not one of them. The fact that you have a question about the medication means you are invested in your health and want to learn more, therefore, don’t ever be afraid to ask questions. But for real, just ask. Consider your lifestyle– Remember that you are the person who is going to have to take the medication that is being discussed. This means that if you think the medication regime is too intense for your lifestyle, you need to bring up that concern with your doctor. Sometimes they can offer tips about how to best use the medication and other times you both decide that it isn’t a good fit for you. Ask about Side Effects– There have been times that I did not ask about side effects of a medication and ended up having to switch medications because I couldn’t deal with the side effects. It is always good to go into the medication with all the details and unfortunately most medications have a variety of side effects. If you don’t know what those side effects are prior to starting the medication it can be scary to experience those things. So just ask, you need to know them! 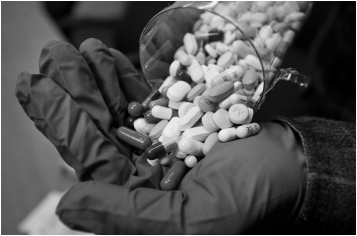 Drug interactions– Don’t ever forget to ask if the medication is going to interact with your other drugs. Sometimes doctors just forget to look at this (they are only human) and drug interactions always need to be considered! Previous Drugs: I have often found that the best way for me to understand the drug we are talking about is to ask “how it compares to other medication I have been on.” By asking this question I am drawing from my previous medication experience and am better able to relate to the drug. Often this question helps me know what to expect with the drug and I can guess how my body is going to respond! Other patients: Asking my doctor about her experience with this drug and other patients is one of my favourite questions to ask my doctor. Sometimes my doctor does not have a lot of experience with the drug, and that is totally fine, but in general, she has used the drug on a number of other patients. This means that she is able to tell me how they have reacted and give tips and tricks for using the drug. I am a big advocate of learning how a drug has effected other patients, so this question really helps me know what to expect! Always remember that doctor visits should be a collaborative effort. You are the ultimate decision maker about medications, so listen carefully and raise any concerns you may have! Just ask! In my opinion, these are really the main things to keep in mind when being prescribed a new drug. If you look back over the suggestions, you will notice that they all help you know more about the drug and what to expect when taking it. Each medication is different and how your body reacts is going to depend on your chemical makeup in comparison to the drugs chemical makeup, but the more you can know about the drug, the better your experience will be! I never take a drug without interrogating my doctor about these various aspects and therefore am confidently able to take each new medication I am prescribed in my not so normal life! Like the “just ask” concept. Good article.